Court Arcade. This facade has been around for many decades, only what is behind it changes… We had a unit there from 1972 until 1990 when we moved to our present site. 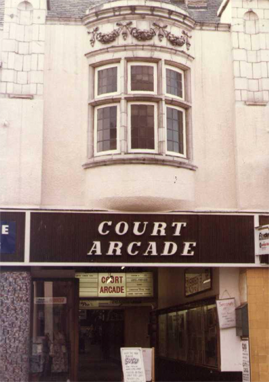 Court Arcade 1972-1990 – This is the facade which was saved when the old Court Cinema burnt down many years ago. By the time we took up residence there, it was a shopping arcade called Court Arcade. The space behind this facade was nothing more than a long shed, divided into units. The units had concrete floors, asbestos in the ceilings, and no proper access to drinking water or toilet facilities. Never the less it became a fantastic ‘alternative’ arcade and was well ahead of its time. We have many happy memories of our time there, and we still in many cases keep in touch with friends we made during those crazy days.